The publishers categorise these book as 'Garden Inspirations - a new series focusing on ideas from great gardens around the world', which is a cumbersome name for a really good idea. They are not series of coffee table books. 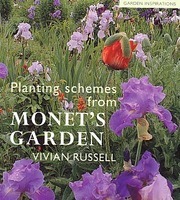 The price is very reasonable and the format is that of 'handbook', with a soft cover and text which provides valuable advice on how to achieve the planting schemes which are the books' subject. So the books can work like this: a photograph catches your eye; text provides the kind of aesthetic commentary on colour and form one might find in a book on art criticism; the plants are carefully and accurately labelled; you can read about the management practice which produces the effect. One then rushes to the garden to discover where the effect might be tried - and then back to the house to source the plants. 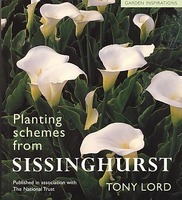 Since Tony Lord also edits the Plant Finder, one can use another of his books to aid this task. The inclusion of garden plans is very welcome, though the Giverny plan does not have a scale. Of the two gardens, I would say that Sissinghurst is the more beautiful and Giverny the more interesting. The photographs are excellent in both books, with Russell's better than Lord's. She has a background in film making and photography is of course an art which has to be learned. The photographs are taken in different seasons. Since most visitors will only make one visit, this provides a level of insight not usually available. Both books begin with introductory sections on their design and designers which are adequate but un-illuminating. It would have been interesting to explain Giverny in the context of nineteenth century gardens and Sissinghurst in the context of Arts and Crafts gardens, as is done in the Garden Visit and Travel Guide. The Arts and Crafts approach is well understood, particularly in England. Giverny is much less comprehensible. Its use of annual plants and bedding plants is at odds with all the gardens which came after William Morris but completely of the nineteenth century. There is also the complicated matter of Monet's impressionism and whether or not it affected his use of colour and plants in the garden. If it did, then those who seek to learn from his approach need to know more of his principles than is explained in this book. To summarise: each of the books is excellent - beautiful, useful and exceptional value for money. I look forward to seeing their successors.